When this card is Normal Summoned: You can Special Summon 1 "Shiranui" monster from your hand or GY, except "Shiranui Spiritmaster", but banish it when it leaves the field. If this card is banished: You can target 1 face-up card your opponent controls; destroy it. You can only use this effect of "Shiranui Spiritmaster" once per turn. 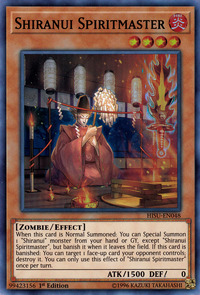 The sword in this card's artwork appears in the artwork of Shiranui Shogunsaga, Shiranui Sunsaga, Shiranui Samurai, Shiranui Samuraisaga, Shiranui Swordmaster, and Shiranui Style Synthesis.